There are parts of Joseph’s story which most people remember: for example that his jealous brothers sold him into slavery and that his personal qualities and clairvoyant skills resulted in him becoming Pharaoh’s right hand man. You may recall that years later, Jacob sent Joseph’s brothers to Egypt to obtain grain, because there was famine in the land of Canaan. When the brothers arrived in Egypt, they failed to recognize Joseph, now the Viceroy or Prime minister, and Joseph showed what must have seemed an odd and threatening interest in these Hebrew brothers from Canaan. He accused them of being spies, demanded that they bring their brother Benjamin to Egypt and meanwhile held Simeon as a hostage to settle the matter. Finally, as the brothers travelled home, they found that the money they had paid for the grain had been returned to them, placed inside their sacks. Today we read that, when the famine continued, Jacob sent his sons again to Egypt. This time they brought with them Benjamin, much against Jacob’s wishes, for Benjamin, like Joseph, was the son of Rachel, and Jacob favoured the sons of Rachel above the sons of Leah. Besides Jacob and his twelve sons, there is another player with a speaking role in this part of the Joseph narrative. This is Joseph’s house steward whose name is not recorded so he is called simply הָאִישׁ אֲשֶׁר עַל בֵּית יוֹסֵף, the man over Joseph’s house. This character appears benign but unexpectedly well-informed, knowing some things which he could have learned only from Joseph. To him, the brothers confide their fears, that they will appear as thieves, because their money had reappeared in their sacks, and that the Viceroy will deal harshly with them, perhaps even take them as slaves. It is an ironic turn of events that the brothers who sold Joseph into slavery now fear being enslaved by him; ironic also that they are wrong in one way and right in another, for Joseph will not enslave them yet their descendants are destined of course to become slaves in Egypt. Joseph’s house steward says: ‘Do not fear; your God and the God of your father has given you treasure in your sacks.’ He then reunites them with Simeon who had been held hostage and brings them to Joseph’s house, where they receive five star hospitality. I am curious about this steward and the way he is just called ‘the man,’ combined with the fact that the brothers refer to Joseph as ‘the man’ and the brothers, if you look closely at this chapter, are not called ‘the brothers’ but ‘the men.’ They are called Joseph’s brothers only at the moment when he reveals to them his true identity, which is not yet, not this week. At last Joseph appears and the brothers bow before him, just as in the dream, which Joseph, as a teenager, related to them, causing them to hate him. They dine with Joseph and get drunk with him, but Joseph never lets down his guard. The next day, he tells his steward to put the men’s silver in their sacks, as before, and to plant in Benjamin’s sack a valuable silver goblet. Years before, the brothers were paid in silver when they sold Joseph to Midianite traders, and now silver keeps coming back to them, an unwanted reminder of a matter they must have hoped was closed. Joseph gives his steward the job of pursuing the men and accusing them of theft. Although they protest their innocence, the goblet is of course found, to their horror, in Benjamin’s sack. It is, we learn, a ‘divining cup,’ which Joseph uses for divination, a common practice in Egyptian society, and Joseph in particular has a tendency towards the psychic, in his own prophetic dreams and the dreams which he interprets. The men return to the city and now Judah begins to play a prominent role, acting as a spokesman for his brothers and attempting to protect Benjamin from punishment. 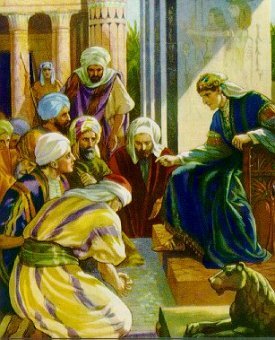 Joseph however declares his intention of keeping Benjamin as a slave and says ‘The rest of you go back in peace to your father.’ The traditional interpretation is that he is testing his brothers, to see if they will abandon Benjamin, as he himself was abandoned, or if they have repented and changed. The themes of identity theft and deception are part and parcel of the Joseph story. They begin in the previous generation, when Jacob disguises himself as Esau and continue when Laban puts Leah in Jacob’s tent instead of Rachel. Then Joseph’s brothers lie to their father, telling him that Joseph had been killed by a wild beast. Now Joseph withholds the truth from his brothers, exercising his power over them to create fear and revive guilt. We await the moment of revelation and reconciliation, which will come in the next sidra, with the whole family together in Egypt and the stage set for slavery, exodus and nationhood.